Donald Trump is planning to build a wall around the USA. His claims that the majority of people crossing the border from Mexico are murderers and rapists, and his plans to stop all Muslims from entering the country until he ‘works out what’s going on’, have seen his poll numbers steadily rise. Proud of making headline-grabbing comments on controversial issues, his latest foray into patriotic defence of the nation has been his questioning of Ted Cruz’s eligibility for the position of Commander-in-Chief. Constitutionally, eligibility is described as a “natural-born citizen” which has been defined as anyone born to a US citizen. In Cruz’s case, he was born in Canada to a US American mother but Trump seems willing to question the citizenship of anyone not born on US soil. In January’s GOP debate in South Carolina, Cruz, in defending himself against the charges of ineligibility, raised Trump’s own heritage and his Scottish-born mother. Trump revealed his true feeling on the matter when he countered with, “but I was born here, big difference.” Of course this is not Trump’s first incidence of questioning a candidate’s right to the Presidency, with his prominent position in ‘the birther’ movement which demanded Obama make his birth certificate public in order to prove his citizenship. 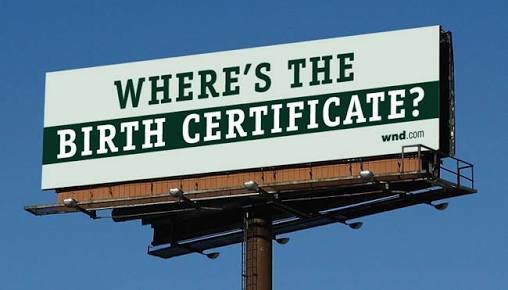 Obama was shown to fulfil Trump’s high standards of being “born here”, although conspiracy theories surrounding forged certificates still abound. The concept of citizenship being linked solely to the geographical location of a person’s birth is a difficult one. In today’s globalised world with it’s long history of migration, many people can trace a heritage containing forebears of various origins and races. A person may have grandparents from four different nations, be born in a fifth and then choose to live their life in a sixth. How does one define citizenship in such cases? For some, rather than attempting to untangle such webs or revelling in the diversity that such instances bring to cultures, it is easier for them to hold onto the ‘born here’ definition of citizenship. A few years ago in New Zealand, t-shirts showing the country’s map and boldly emblazoned with “Born Here” had a summer of popularity, and although the t-shirts have now faded and been worn out, the attitude they exhibited is still very much apparent. In a recent discussion with a couple of middle-aged, white New Zealanders, they visibly bristled when I classed myself as a ‘Kiwi’. As someone who has lived in the country for 11 years and chosen citizenship of a place I love, in their eyes I could never be a ‘real’ New Zealander. This was by no means the first time I had encountered such an attitude from within the same demographic, themselves descended from migrants to the country sometime within the last 200 years. It points towards a desire to close the doors of immigration after themselves, just as Trump, who so highly values his own status of being born in the USA, is ready to deny citizenship to all US-born children of illegal immigrants. “We don’t need Muslims in New Zealand“. Perhaps the comment which showed the greatest lack of empathy for the refugees’ suffering and eligibility for a life in New Zealand was one bemoaning the trifling inconveniences of their own migration to New Zealand. Again the ‘I’m here, now let’s not make it easy for anyone else’ attitude. Countries such as the US and New Zealand were built on the foundations of colonial land grabs, subjugation and, in some cases, slaughter of the lands’ earliest residents. Now, the majority of the population of these nations are immigrants or descended from immigrants, many of whom were escaping atrocities elsewhere in the world, others who made the move in search of a better way of life or economic gain. It would seem that some of those are content with the idea that the “huddled masses” are no longer wanted and now is the time to draw in the welcome mat and securely bar the doors to prevent any new interlopers from sharing in the benefits they themselves have enjoyed.